Dallas Bishop Edward J Burns delivering his catechesis session. Image: Diocese of Parramatta. His Holiness Pope Francis arrived in Panama, on Wednesday afternoon local time, to celebrate World Youth Day 2019 with hundreds of thousands of pilgrims from around the world. The Holy Father was greeted by local dignitaries including the President of Panama and the First Lady. Meanwhile, across Panama City, catechesis, festivals and fairs were held in several locations for the pilgrims with a focus on vocations, art, spirituality and culture. Bishop Edward J Burns delighted Australian, Canadian, US, South African, Irish, UK and other English-speaking pilgrims for the first World Youth Day catechesis session. Australian and South African pilgrims during catechesis in Panama City. Image: Diocese of Parramatta. Known for his very personal style and passionate preaching, Bishop Burns was appointed by Pope Francis in 2016 to the big ‘D’ – the Diocese of Dallas, home to 1.3 million Catholics, having previously been the Bishop of Juneau, Alaska – with a mere 10,000 Catholics. Whilst he was Bishop of Juneau, he was known to arrange a weekly Skype call with all eight priests of the Diocese for prayer and pastoral support. Dallas Bishop Edward J Burns celebrates Mass, concelebrated by Archbishop Anthony Fisher and Bishop Vincent Long during catechesis in Panama City. Image: Diocese of Parramatta. The catechesis events are run over three days during World Youth Day, catering to specific languages. Pilgrims have the opportunity to meet and interact with pilgrims from other countries. Each catechesis has time for worship, interaction, a talk given by a Bishop, and completed by Mass with a homily. Catechesis sessions are taking place across Panama City in churches and other chosen venues to ensure that all young people can participate. In his challenging homily to pilgrims, Bishop Burns addressed the concept of unjust laws, “just because something is the law, it doesn’t make it right. In our country, we have had a dark history, slavery was not right, women not being able to vote was not right, abortion isn’t right. “We safeguard the sanctity of every human person. My friends, never be paralysed in serving our brothers and sisters, for in serving them are we able to serve our God. “Every country has the right to protect its borders, but we never want to fail to see the dignity of the human person – our God is an immigrant God, he had to immigrate from the Divine to Human and then again to flee to Egypt. When you welcome a stranger, you welcome me,” he said. English-speaking pilgrims are seen during catechesis in Panama City. Image: Diocese of Parramatta. 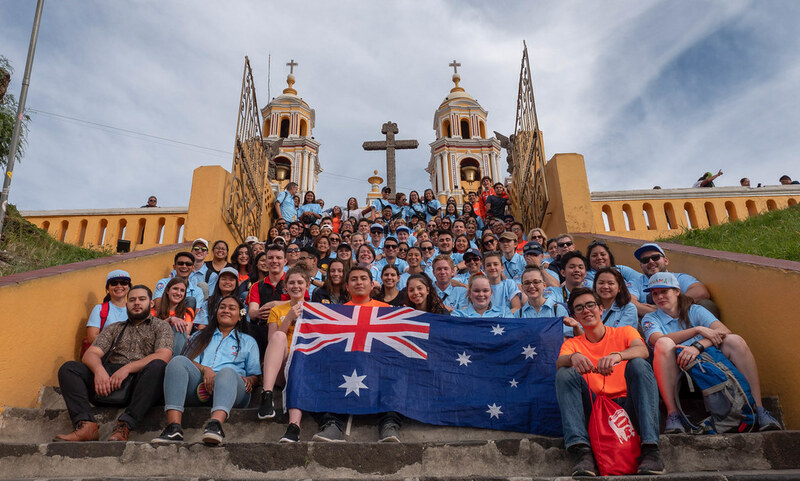 During the afternoon, pilgrims had the opportunity to encounter the World Youth Day festival events including a youth festival highlighting an artistic, spiritual and cultural program and a Vocations Fair where religious organisations and other groups present their charism and works. Of special mention is the US Bishops’ Conference encounter with Bishop Robert Barron (Auxiliary Bishop of the Archdiocese of Los Angeles) who has been described as a “social-media superstar” and “The Bishop of Catholic Social Media” by The Wall Street Journal.